Faith, do you have any? 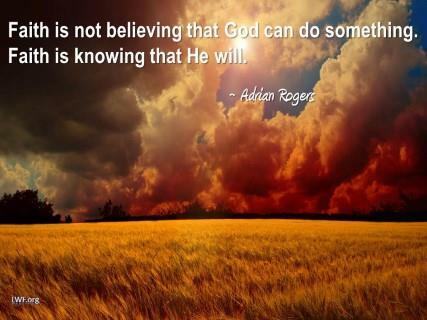 We are supposed to have faith in God and in His Son, if you are a believer. Those who don’t believe in Him, for whatever reason, don’t have faith in God although they know of Him. Knowing about a person, whether it is a celebrity, a sports figure or an entertainer or God Himself, does not amount to truly knowing that person. Do you know someone in a political office or just know about them? How about those players on the national football or basketball teams, do you know them personally? No, you can quote statistics about their ability to play their respective games but you don’t know them. That is the difference between knowing about someone and really knowing them. That is why God created the relationship of marriage between a man and a woman, so we can have an idea of what our relationship with Him is supposed to be. Faith in God and in His provisions. Living as a Christian gives you freedom and it really doesn’t hinder your life. The problem that many people have with it is that they see all of the things that they can’t do after becoming a Christian. Jesus never told anyone that you can’t do this or that, He just told them to go and sin no more. Although it is true that we can’t successfully do that in our own strength, we can with His Spirit living in our hearts. It is a lie that some believe that they can be righteous and holy after becoming a Christian, you can be but not twenty-four hours a day! You will have sinful thoughts, you will say things or think things about someone that are sinful, we are not perfect. We can strive to be perfect in our ways and follow His example, as long as we are truly His and follow Him by reading and learning the wisdom of God from the Bible. Apply this wisdom to your life, your family and your business practices and you are a few steps down the road toward Jesus. This is the only way to truly belong to Him. If your salvation experience did not bring you to the cross to lay your sins down and walk away from them then you may need to check to see if you are His. God loves you more than you can realize, but if you keep pushing Him away and putting the leading of the Holy Spirit on your heart off, then He may give you over to your sins and to Satan. If God has a purpose for you to fulfill, then He will get your attention and you will come to Him. If you are being stubborn about it, the consequences could be like Job in the Bible, but then again they might not be. We are not guaranteed our next breath, let alone tomorrow or next week, so putting off God’s call on your life is not a good or wise choice. Give your heart to Him, follow His steps and His purpose for your life. It doesn’t mean that you will be a missionary in some foreign land or a preacher but be willing to be whatever God calls you to be. The rewards may not be such that the world will take notice, but your impact on your world locally could be tremendous and the seeds that you plant may take root in someone’s heart on the other side of the world. God may use t hem to make an even larger impact, but the seed that started it all can come from something as simple as this page, this message. All you have to do is be receptive to the call, the pull of the Holy Spirit in your life and your heart. Let God do the rest. Many people seem to have a stance on faith which says that they either don’t have any at all, which makes them an agnostic or an atheist or they are totally committed to God and try to serve Him to the best of their ability. Then there are those who have other belief systems, which I will not try to name because I would offend someone just because I left their’s out of the list. The point of this is to say that your beliefs or your lack of belief is your business. It is not mine nor anyone else’s, nor is it my job to try to convert you to my belief system, whether it is Christian or otherwise. Yes, my site is about my own faith in Jesus and I do write to bring the Truth of Jesus and His role in Salvation to the world but I am not such a zealot as to get upset because you may not have the same beliefs that I do. God loves all of us, each person on the Earth is watched over by Him, yet He doesn’t interfere in your life. He is not going to knock you down just because you did something that He doesn’t agree with. God is not a vengeful, racist and merciless dictator! He is God, the Creator of all and He loves you with all of your quirks and imperfections because He made you that way! God created you as a unique creation, a person which is one-of-a-kind. There is nothing strange about any one of us, we are all just different. We come from different backgrounds, different cultures, different belief systems and countries and yet we are all human beings and we are loved by God! Doesn’t that make you feel special? The Creator of everything knows you! We are not just random collections of chemicals which happened to form into the shape and abilities that we have because nothing happens by accident or chance. Your life is and always has been mapped out by God, but He doesn’t force you to go in any one direction. He just knows which step you will take because of Who He is! He is outside of time so He can see all of your life and mine. God has a purpose for each one of us and all we have to do is to get it through our mind and our own stubborn nature that we need to find out what that is and then strive to accomplish it! Your life is in God’s hands and always has been, whether you believe in Him or not. Our purpose cannot be done on our own strength yet we must rely on God and His strength to carry us to the point of completion regardless of the amount of work that it requires. The work that I am speaking of is the work that God has for us to do. We cannot work our way into heaven on our own merits, the things that we must do because God has done the work to bring us to Himself are the things that He has for us to do for Him. If you have not given your life and your heart to Jesus and asked Him to come into your life, then please do so. If this has been a thought in your mind even just once, then that is the calling on your life to be a child of God and one who can do whatever you are called to do. Consider this, pray about it even if you have never prayed before to God, He will hear you and will answer you because He loves you.